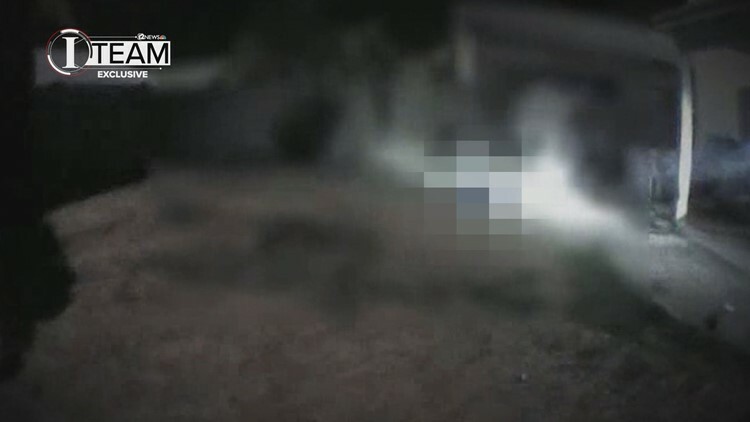 Body camera video obtained by 12 News is at the center of a federal lawsuit against Mesa and Gilbert police, alleging negligence and civil rights violations in the 2016 shooting death of a 27-year-old man wielding knives. The family of Sergio Ochoa, a 27-year-old shot 21 times by Mesa and Gilbert police officers on March 3, 2016, has filed a wrongful death lawsuit against the departments and nine officers, alleging civil rights violations in Ochoa’s death. “I don’t know how to describe the pain; it’s unbearable sometimes,” said Ochoa’s mother, Leonorilda “Lilly” Ochoa. Lilly is one of six plaintiffs named in the federal lawsuit, along with three of Ochoa’s children and two of the children’s mothers. “It was a nightmare,” Lilly said. “Sergio’s execution-style killing was unprovoked, unwarranted, unjustified, callous, depraved, vicious and evil,” attorney Marc Victor, representing Ochoa’s family, wrote in the lawsuit. “Thirty rounds down range looks more like an execution squad to me than someone we are trying to get under control,” Victor told 12 News. Both Gilbert and Mesa police denied the allegations in court filings. Gilbert police responded to requests for records in this case, but did not provide comment on the specific allegations beyond what was included in court documents. Mesa PD sent a statement to 12 News Monday night, noting that six Mesa officers discharged their weapons and one officer used a bean bag round. “This was a fast and dynamic situation involving Mesa Detectives and Gilbert K9 Officers,” Mesa PD said about the incident in a statement sent to 12 News. “We can confirm that six Mesa Police Officers discharged their weapons, one Mesa Officer used a less-lethal bean bag. Once Ochoa was stopped, Officers waited for a K9 to arrive to ensure Ochoa was no longer a threat for paramedics to safely render aid. The Gilbert Police Department investigated the Officer Involved Shooting portion of this incident. For additional details or questions refer to the Gilbert report." “The level of force used was objectively reasonable and legally justified, and in response to an immediate and substantial threat,” a Mesa attorney wrote in court filings. “Just because one perceives something, it doesn’t mean the rest of them are justified. Each one of the officers have to be justified in what they did,” said Andy Anderson, a retired police officer who analyzed the body camera video. “We teach officers to de-escalate and we want that to happen but not every situation lends itself to de-escalation,” Anderson said. Gilbert police reports lay out the events leading up to the shooting on March 3, 2016. At approximately 9:25 p.m., Mesa police received a 911 call from a woman claiming her ex-boyfriend, Ochoa, had threatened her with a handgun. According to the police report, Ochoa fled the house and left the gun behind. Approximately 10 minutes later, the reports state, another Mesa resident called police and said that Ochoa attempted to steal a woman’s cell phone and enter her home. He drove away from the home and Mesa police began a search, including using the helicopter. At this point, an undercover unit of Mesa officers conducting surveillance in unmarked vehicles began to follow Ochoa and the helicopter was able to see Ochoa leave his car and hide near another house. Upon arrival at the third house, police reports say a man who lived there confirmed that Ochoa had entered the house and did not live there. New video shows the shooting of Sergio Ochoa who police say was threatening them with a knife. The man who lived there began to remove children from the house through a window, according to a Gilbert police report. A team of officers observed Ochoa in the house with at least one knife, according to police reports, so officers entered the home through the front door and followed Ochoa as he ran out the back door, where officers stated he was threatening with knives. A toxicology report would later reveal Ochoa had meth in his system, among other drugs. Within 30 seconds of entering the front door, according to body camera footage worn by Gilbert police, nine officers had shot Ochoa, striking him 21 times. About four minutes later, a K-9 officer is sent to drag Ochoa away from the knives, according to police reports. Fire personnel respond to treat Ochoa nearly six minutes after he was shot. He would be pronounced dead more than an hour later at the hospital while undergoing surgery, according to the medical examiner reports. Ochoa’s family are seeking compensatory damages in this case and say in the lawsuit, they hope this will deter police behavior in officer-involved shootings. For tips on this or any other story, contact Michael Doudna mdoudna@12news.com.